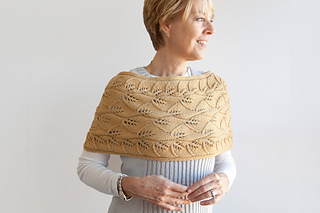 Corinne is an attractive wrap for the shoulders or cowl for the neck, textured with simple leafy lace. It’s worn well both inside or out, providing warmth with style. Worked lengthwise, the dimensions of its grafted loop are easily modified by row count or gauge to suit preferences of size or purpose. 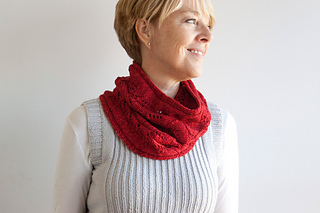 The short rows at its upper edge taper lines for a sleeker fit. 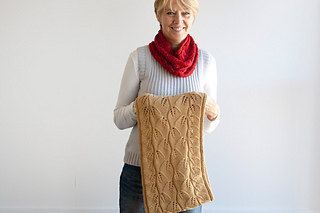 You’ll find Corinne to be a fun and quick, multi-season project. Great as a gift too – surely a welcomed addition to any wardrobe. XS/S, M/L, 1X/2X – 13½“ / 34.25 cm by 42, 49, 56” / 106.75, 124.5, 142.25 cm loop at hem and 34, 40, 45” / 86.25, 101.5, 114.25 cm at neckline edge (shown in size XS/S). Shown in Merino Alpaca wool by Shibui Knits (50% baby alpaca, 50% merino wool; 131 yds / 120m per 3.5 oz / 100 gram skein); color – Flaxen #2010; 3, 4, 4 skeins, or for comparable yarn, approximately 390, 460, 525 yards / 360, 420, 480 m.
Shown in Rios wool by Malabrigo (pure Merino Superwash; 210 yds/192 m per 3.5 oz / 100 gram skein); color – Ravelry Red #611; 2 skeins, or for comparable yarn, approximately 270 yards / 250 m.
Provisional cast on, short row shaping, decreases (k2tog, p2tog, ssk, ssp), increases (yo), grafting textured fabrics, and blocking. 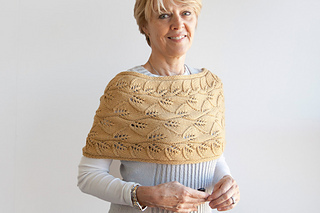 6 page pdf includes pattern instructions, lace chart and description, photographs, schematics, links to online instructions, and relevant abbreviations and definitions.